The Dekatone would not require extensive training to manoeuver. 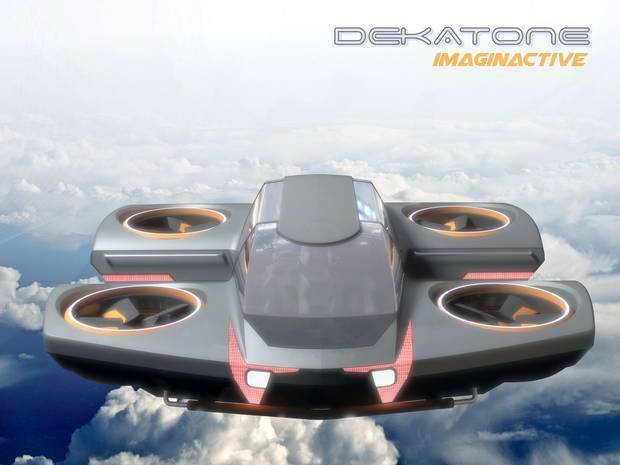 The Dekatone is an electric flying car concept equipped with four propellers and a clever control mechanism that makes flying as easy as driving a car on pavement. 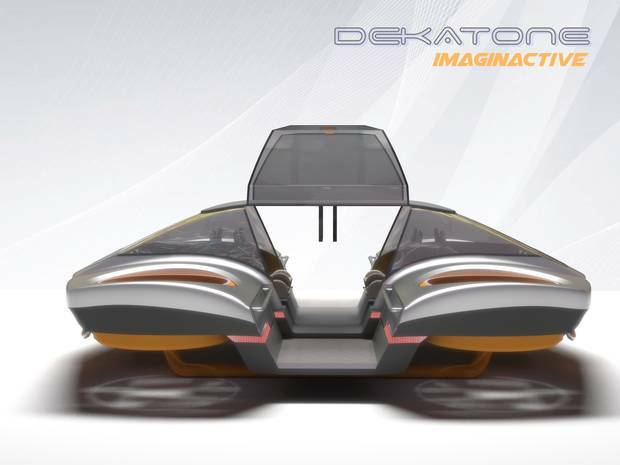 It could be scaled to transport 2 to 8 passengers depending on the flight duration and useful load taken aboard. The idea for the Dekatone was proposed to me by Gary Daprato, a Toronto-based inventor. Gary built a scale model of his idea and approached me to create a vision for what it could look like as a civilian transport car. Distributing the centre of gravity to the four corners of the vehicle gives it more stability in the air. Aircraft have traditionally, with a few exceptions, relied upon a single centre of gravity for guidance. This demands great skill and extensive training for any new pilot. With a harmonized, rapidly actuating, gimbaled variable thrust set to the four corners of an aircraft, unprecedented control can be achieved and a new type of flight experience can be developed for small vehicles like the Dekatone. By isolating the pitch and roll moments required to manoeuver at the gimbals, the aircraft and its occupants would no longer be subjected to these effects, thereby reducing the act of piloting to simply driving. 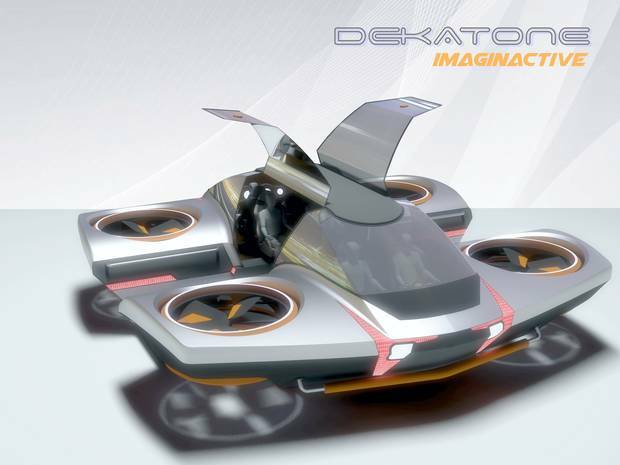 Piloting the Dekatone would feel a bit like driving a car on pavement. What this means is that the Dekatone will remain substantially horizontal while a novice pilot is manoeuvering it. In other words, no more pitching and rolling to turn. The aircraft would fly flat, and you would be able to drive it a bit like a car in two-dimensional flight. As you can imagine, the technical details of Gary's invention will not be disclosed here. However, you are more than welcome to contact him to learn more. The first step is making certain there is an interest for such a machine. If there is, then a more detailed engineering study should be done to spec and design a possible prototype. The aircraft's ease of use would give it an edge over other flying cars. By reducing the complexity of flight control to a manageable state and combining advances in material and mechanical design, we envision a whole new market for mass-produced air vehicles: personal aircraft for the average person. The Dekatone will definitely have lots of competition, but its ease of use and safe enclosed propellers will give it a clear advantage. 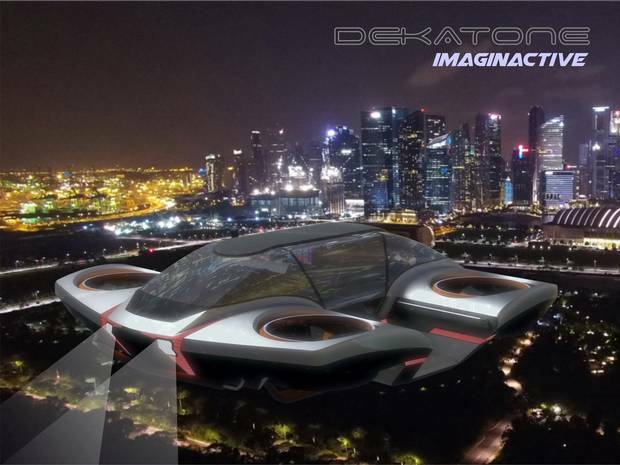 The car’s clever control mechanism would create a new type of flying experience. 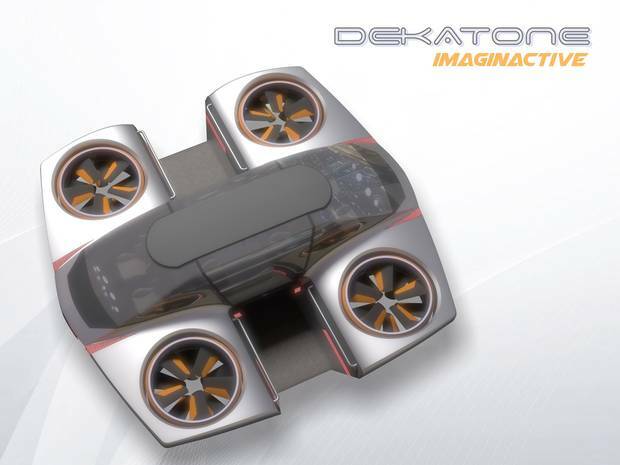 I would like to thank Adolfo Esquivel, who created the graphic renderings of the Dekatone flying car. Adolfo graduated with an industrial design degree from Colombia and completed his postgraduate education in events design at Université du Québec à Montréal. Adolfo also created the images of the Aquafun all-season personal watercraft along with dozens of other concepts for Imaginactive.